Objective: To identify updated trends in antipsychotic prescribing patterns in patients with schizophrenia in East Asia. Methods: Using the data from the 2001, 2004, and 2008 Research on East Asia Psychotropic Prescription (REAP) studies, we compared the proportions of acute inpatients (stay <6 months), new long-stay patients (6 months to 3 years), and old long-stay patients (≥3 years), the rates of excessive dosing (more than chlorpromazine 1000 mg equivalent) and polypharmacy (the coprescription of more than 1 antipsychotic). Findings: While the proportion of long-term inpatients increased over time in Chinese mainland and Taiwan, it decreased in Japan, Singapore and Hong Kong. The proportion of acute inpatients receiving more than one drug was highest in Singapore, followed by Japan, Korea and Chinese Mainland. Two-drug combination therapy was especially high in Singapore. Korea had the highest rate of excessive dosing followed by Japan and Hong Kong. While the rates of both polypharmacy and excessive dosing decreased significantly over time in Japan, polypharmacy increased significantly in Chinese Mainland and Taiwan and excessive dosing increased significantly in Korea and Hong Kong. Conclusion: Our results suggest that the change in antipsychotic prescribing patterns, including excessive dosing and polypharmacy, varied among the participating East Asian countries/areas. Antipsychotic polypharmacy, the prescribing of more than one antipsychotic drug concurrently, is a common prescription pattern in clinical practice . Although the prevalence of anitipsychotic polypharmacy varies, the results from most studies ranged between 10% and 30% . Polypharmacy may result exceed the total dose of antipsychotics , and may cause increases in admissions to hospital  and mortality . Polypharmacy was frequently observed in patients with severe conditions [4,6]. Long-stay patients are likely to be severe and treatment-resistant; therefore, they are at risk of polypharmacy. Recent studies showed that the length of stay of patients receiving antipsychotic polypharmacy was longer than that of patients receiving monotherapy [7,8]. The prescription of high-dose antipsychotics is also of concern because of the lack of evidence to support its effectiveness and because of its association with greater adverse effects . The probability of the prescription of high-dose antipsychotics is increased by polypharmacy . Compared with the West, hospital care for patients with schizophrenia is still prevalent in many East Asian countries/areas. The treatment pattern of inpatients, however, is changing in East Asia . Of newly admitted patients, most are discharged earlier, but some stay longer due to treatment-resistant and severe diseases . Those who are newly admitted and stay longer in hospitals are referred to as “new long-stay” patients in addition to “old long-stay” patients who are older and resistant to discharge. The objective of this study was to identify updated trends in the prescription patterns of antipsychotics in patients with schizophrenia in East Asia. We compared the proportions of acute, new long-stay, and old longstay inpatients and the rates of excessive dosing and polypharmacy in 2001, 2004 and 2008 using the data from the Research on East Asia Psychotropic Prescription (REAP) studies. The Research on East Asia Psychotropic Prescription (REAP) studies were designed as hospital-based crosssectional surveys to examine the prescription patterns of psychotropic drugs (antipsychotics, mood stabilizers and antidepressants) among inpatients in East Asia. The details of the REAP studies have been described elsewhere [12-15]. The studies were conducted in 2001, 2004 and 2008 in six Asian countries/areas (Chinese mainland, Hong Kong, Japan, Korea, Singapore and Taiwan) using a standardized protocol and data collection procedure. The REAP studies were approved by the Institutional Review Boards of all the participating centers in each country. The Institutional Review Board of the National Center of Neurology and Psychiatry, Japan, also approved the analysis of data for this study. The participants were patients with schizophrenia who were consecutively admitted to each site. We identified inpatients using the diagnostic criteria for schizophrenia according to the International Classification of Disease, 10th edition (ICD-10)  or the 4th version of the Diagnostic and Statistical Manual of Mental Disorders (DSM-IV) . The REAP study coordinators collected data from the medical charts of inpatients at each site, transcribed them into a uniform data entry sheet, and forwarded the sheet to the national coordinating centers of each country. Each national coordinating center compiled data from the participating centers and sent them on to the overall coordinator in Kobe, Japan, for compilation and analysis. Patients with clinically significant medical conditions or active psychotic symptoms related to comorbid substance use disorders were excluded. We divided the patients into three groups based on length of stay: acute (stay <6 months), new long-stay (6 months to 3 years), and old long-stay inpatients (≥3 years). New long-stay patients were defined as those who occupied psychiatric beds for a prolonged period among individuals receiving services oriented towards community living . The primary psychiatrist completed uniform questionnaires about the participating patient at each site. Alternatively the questionnaire was completed by a member of the research team with the agreement of the primary psychiatrist . The questionnaire included sociodemographic information and clinical characteristics including psychopathology and all psychotropic drugs prescribed. Depot antipsychotics given within 30 days of admission were also documented. Daily doses of antipsychotics, including depot preparations, were converted to approximate daily mean chlorpromazine mg equivalents (CPZeq) using standard guidelines [18-21]. In this analysis, we assessed the excessive dosing of antipsychotics and antipsychotic polypharmacy during inpatient care. In terms of excessive dosing, we divided the prescribing patterns of the total daily doses of antipsychotic medications into two categories: 1) those patients receiving ≤1000 CPZeq mg per day (appropriate dosing group) and 2) those receiving >1000 CPZeq mg (excessive dosing group). The second indicator, antipsychotic polypharmacy, was defined as the concurrent use of more than one antipsychotic drug. Data were analyzed using SPSS 13.0 for Windows. We performed t-tests, Mann-Whitney U tests and chi-square tests. The one-sample Kolmogorov-Smirnov test was used to assess the normality of distribution of continuous variables. The level of significance was set at 0.05 (two-tailed). The 2001, 2004, and 2008 studies included 2399, 2136, and 1906 participants with schizophrenia admitted to psychiatric hospitals at the study sites, respectively. 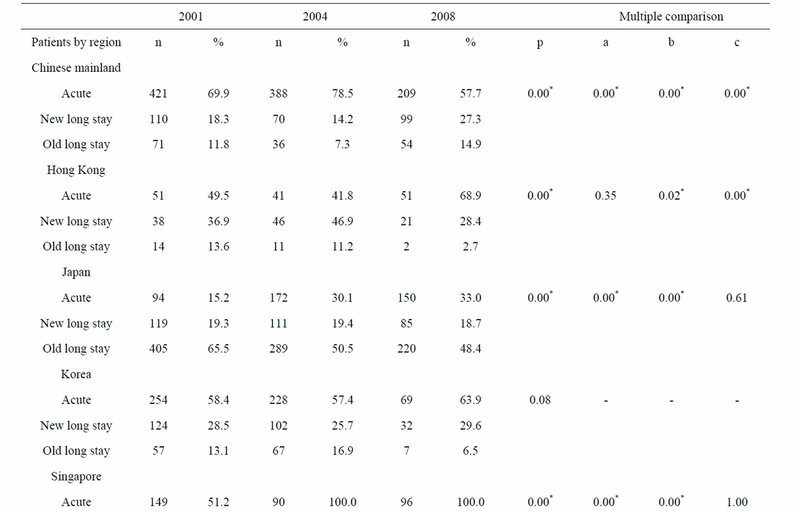 In 2008, the proportion of patients in acute care was 57.7% in Chinese mainland, 68.9% in Hong Kong, 33.0% in Japan, 63.9% in Korea, 100% in Singapore, and 43.2% in Taiwan (Table 1), and was significantly higher in Hong Kong, Japan and Singapore and lower in Chinese mainland than in 2001. 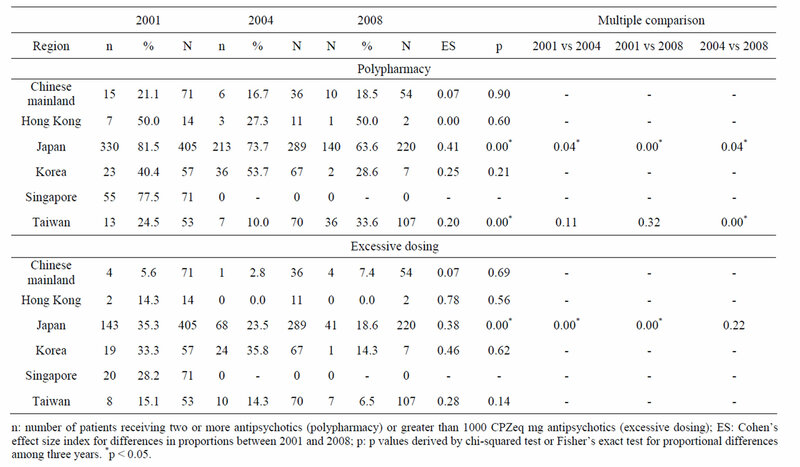 The trend in the prescription of antipsychotics in acute patients is shown in Table 2. 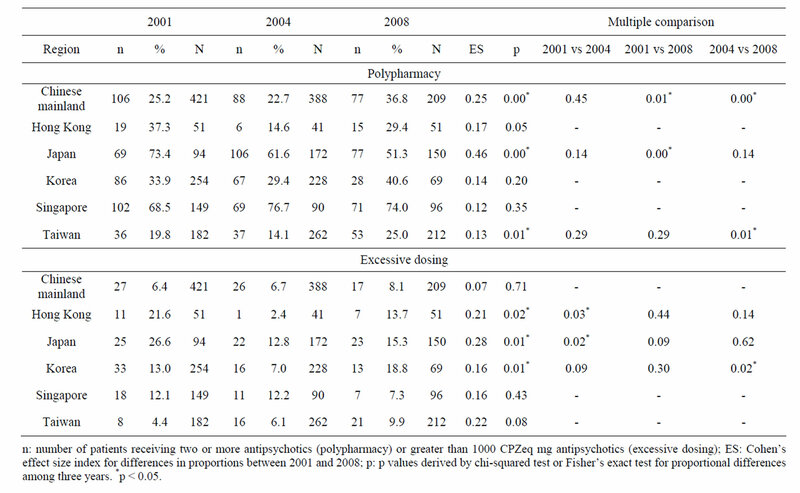 Excessive dosing was seen in 18.8% of cases in Korea, 15.3% in Japan and 13.7% in Hong Kong in 2008. In Korea, the rate of excessive dosing in 2008 was significantly higher than that in 2004 (7.0%). The rates in 2004 in Japan and Hong Kong were significantly lower than those in 2001. Table 1. Changes in patient groups. gapore, 51.3% in Japan, 40.6% in Korea, 36.8% in Chinese mainland, 29.4% in Hong Kong and 25.0% in Taiwan in 2008. In Japan, the rate in 2008 was significantly lower than that in 2001 (73.4%). In contrast, the rate in 2008 was significantly higher than that in 2001 (25.2%) in Chinese mainland, that in 2004 in Chinese mainland (22.7%) and that in Taiwan (14.1%). 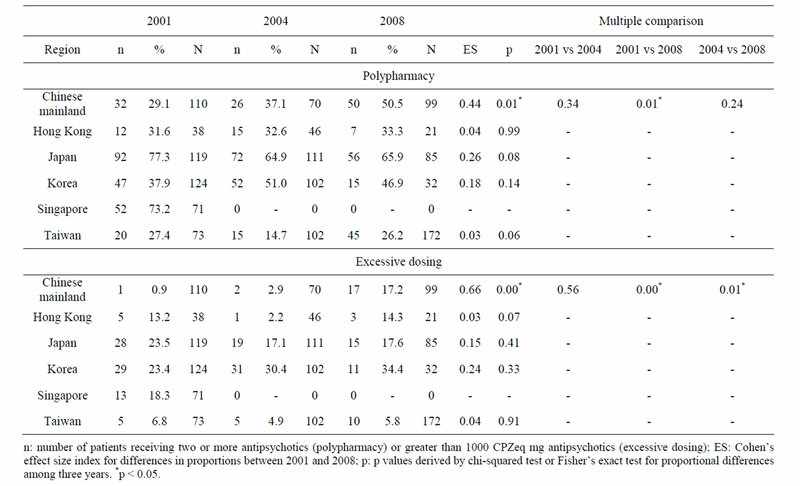 The most frequent patterns of polypharmacy in Singapore in 2008 were risperidone and zuclopenthixol decanoate (n = 8), followed by risperidone and flupentixol decanoate (n = 7), and trifluoperazine and fluphenazine decanoate (n = 5). The proportion of inpatients receiving three or more antipsychotics in 2008 was 23.3% in Japan, 12.5% in Singapore, 5.9% in Hong Kong, 4.3% in Chinese mainland, 2.9% in Korea and 0.9% in Taiwan. As shown in Table 3, excessive dosing was seen in 34.4% of cases in Korea, 17.6% in Japan and 17.2% in Chinese mainland in 2008. In Chinese mainland, the rate of excessive dosing in 2008 was significantly higher than those in 2001 (0.9%) and 2004 (2.9%). Table 2. Excessive dosing and polypharmacy in acute patients by region. Table 3. Excessive dosing and polypharmacy in care for new long stay patients by region. In the prescription of antipsychotics for old long-stay patients in 2008, excessive dosing was seen in 18.6% of cases in Japan and 14.3% in Korea (Table 4). In Japan, the rates in 2008 (14.3%) and 2004 (23.5%) were significantly lower than that in 2001 (35.3%). The rate of polypharmacy in 2008 was 63.6% in Japan and 33.6% in Taiwan. The rate in Japan in 2008 was significantly lower than those in 2001 (81.5%) and 2004 (73.7%). In Taiwan, the rate in 2008 was significantly higher than that in 2004 (10.0%). The trends in the number of inpatients and in excessive dosing and polypharmacy varied across East Asia. While the proportion of long-term inpatients increased over time in Chinese mainland and Taiwan, it decreased in Japan, Singapore and Hong Kong. In Singapore and Hong Kong, inpatient care is now focused on acute care. Japan and Korea, where the numbers of beds per capita and long-stay inpatients are high, seem to be in a process of deinstitutionalization. In contrast, inpatient-care facilities are still lacking and the number of beds is increasing in Chinese mainland , thus, long-stay inpatients linger. Japan has been often criticized for the use of polypharmacy [13-14,23]. There are multiple factor involved in the use of polypharmacy, such as physician distrust of the practice guidelines, requests to increase the number of nursing staff members, and patient characteristics . The change in reimbursement which encourages the use of less than three antipsychotics over the use of more than three antipsychotics and third-party evaluation might have facilitated the changes in antipsychotic prescription patterns. Japan had the highest rate of the prescription of three or more drugs, but the percentage of patients treated with polypharmacy in acute care has been decreasing over time. The rate at which acute care inpatients were prescribed two or more drugs was highest in Singapore, followed by Japan, Korea and Chinese mainland; however, the prescripion pattern in Singapore is different from those in the other countries/areas. A high rate of polypharmacy in Singapore has been demonstrated by previous studies [12,13]. However, the prescription of two drugs only was most prevalent, and most of these prescriptions are co-prescription with depot. Chinese mainland, Korea, and Taiwan show opposite trends of increased polypharmacy. Table 4. Excessive dosing and polypharmacy in care for old long stay patients by region. meta-analysis of randomized controlled trials comparing single-drug and multiple-drug regimens in schizophrenia, polypharmacy was demonstrated to be superior in terms of efficacy and the discontinuation of medicine , which suggests that polypharmacy may not necessarily always be contraindicated. However, it remains controversial [2,9]. Regarding excessive dosing, Korea had the highest rate of patients who received excessive dosing, followed by Japan and Hong Kong, while this rate was relatively low in Singapore. Interestingly, while the rates of excessive dosing were declining significantly in Japan, the rate of excessive dosing was increasing in Korea. This study demonstrated the characteristic prescribing trends in Chinese mainland and Korea. Previous studies reported that the antipsychotic dosage prescribed in Chinese mainland was lower than that prescribed in Japan . However, the results of the present study demonstrated that the dosage was increasing among long-stay inpatients in Chinese mainland. China is currently undertaking a policy of expanding mental hospitals and psychiatric departments in general hospitals , which is leading to an increase in the number of patients who become resistant to treatment, resulting in higher rates of excessive dosing. Higher antipsychotic doses may be needed in cases with more severe illness , but the efficacy of higher doses (sometimes with polypharmacy) should be employed only as a strategy for dealing with treatmentresistant schizophrenia [28,29]. A further question to be considered is whether the prescription styles used in the treatment of long-stay inpatients influence the prescription practice for acute care patients. Implementing changes in care styles, such as improving polypharmacy and excessive dosing, takes a long time; for example, Japan needed at least 20 years to improve the prescription patterns and nearly 50 years to achieve deinstitutionalization in psychiatric inpatient care because of the predominance of private hospitals. There are several limitations to this study. First, due to its cross-sectional research design, this study does not investigate the efficacy of different prescription regimens. Second, we examined the antipsychotic prescription patterns at a single or several sites within each country. Although we could examine the chronological changes that occurred in each country, it is difficult to determine across-country differences because the population samples used are non-representative. Despite these limitations, this cross-sectional study provides insights into the antipsychotic prescription patterns for inpatients with schizophrenia in East Asian countries. The West and the East have pursued different paths in the field of mental health care. Western countries started to reduce the number of psychiatric beds in the middle of the 20th century and shifted from traditional hospital care to community care [30,31]. In contrast, institutionalized care has remained a mainstream practice in many Asian countries . Although a recent global trend involves a shift in care from hospitals to communities, the role of inpatient care is different among individual East Asian countries, and the development of community services is at different stages in each of these countries. At any stage, the recommendations for the prescription of antipsychotics should be followed in practice. This study was supported by Grants-in-Aid for Research on Regulatory Science of Pharmaceuticals and Medical Devices (Ministry of Health, Labour and Welfare, H22-IYAKU-IPPAN-013). This study was presented in part at the International College of Neuropsychopharmacology Thematic Meeting at Salzburg, April, 2011. Ito, H., Setoya, Y. and Suzuki, Y. (2012) Lessons learned in developing community mental health care in East and South East Asia. World Psychiatry, 11, 186-190. World Health Organization (1992) International statistical classification of diseases and related health problems, 10 rev. World Health Organization, Geneva, 1992. American Psychiatric Association (2007) Practice Guidelines for the treatment of patients with schizophrenia. American Psychiatric Press, Washington DC. Inagaki, A., Inada, T. and Fujii, Y. (1999) Equivalent dose of psychotropics. Seiwa Shoten, Tokyo. Gilmer, T, P., Dolder C.R., Folsom, D.P., Mastin, W. and Jeste, D.V. (2007) Antipsychotic polypharmacy trends among Medicaid beneficiaries with schizophrenia in San Diego County, 1999-2004. Psychiatric Services, 58, 1007-1010. Frank, R.G. and Glied, S.A. (2006) Better but not well: Mental health policy in the United States since 1950. Johns Hopkins University Press, Baltimore. Thornicroft, G. and Tansella, M. (2009) Better mental health care. Cambridge University Press, Cambridge.